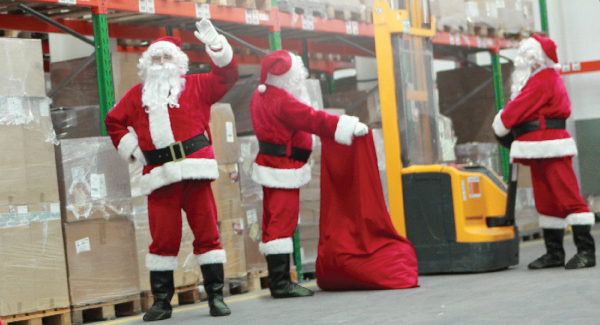 Whether your temporary peak periods are linked to holidays or seasons, these tips will keep your distribution center merry and bright. With a new distribution center that's five times as large as the previous one, its first warehouse management system (WMS), and an additional foundry coming online in fall 2017, Lodge Manufacturing Company is poised to meet the demands this year's holiday rush will ring in. The 122-year-old manufacturer of seasoned cast iron skillets, griddles, and other cookware plans to begin drop shipping online orders generated by its customers' websites this holiday season. Drop shipping will eliminate double-shipping the products—from Lodge to the retailer and then to the consumer—while also erasing the need for retailers to stock every Lodge product in their own distribution centers. It also will allow Lodge's retail customers to offer a larger product selection online than they can display in stores. But Lodge is leaving nothing to chance as it anticipates the impact of these changes. Following one of the seven commandments of distribution center holiday rush preparation, the Tennessee-based company is pilot-testing the new drop-ship option before introducing it to select retail customers. "We're making sure we have the right processes in place by testing this new shipping process with a specialty gourmet retailer first," says Sam Touchstone, senior vice president, finance and administration for Lodge. "We set up the warehouse to support it and are coordinating with our WMS provider to make sure the new automated system works properly." Finding one of these new software solutions in your stocking might help solve your holiday demand challenges. EVS's mobe3, the first iOS-based warehouse management system, optimizes and improves warehouse workflow. It's also the first WMS that can simulate warehouse operations under multiple scenarios. This lets a company determine how to lay out a new warehouse or improve an existing facility, add new equipment, update picking methods, or optimize staff for a busy season—all before making changes. In addition, because the user interface is an iPhone app, it's familiar to many warehouse employees. SmartPack Trailer from Zebra Technologies uses video and 3-D depth sensing to let companies calculate load density and trailer fullness, or view images of loads in progress. The system's software, analytics, and ceiling-mounted hardware integrate with various enterprise resource planning systems to track truck volume efficiency, load rate, and when a load is nearing completion. The system also helps loading dock supervisors make on-the-spot decisions to help employees work faster and more efficiently. Honeywell's Vocollect Voice is a voice-activated and data capture technology that warehouse workers use to improve accuracy, increase efficiency, and cut employee training time in half. Workers wearing a Vocollect headset get input on what to pick and where to find it, as well as answers to questions. System data is shared with the company's WMS so stock is automatically updated as it's picked. Vocollect Voice also documents the amount of time it takes to pull orders, which helps track workforce efficiency.